The high Back Apple Green cushions are tailored in shape and size to match our range of metal garden chairs. The cushions include zips to allow separation of the fabric and the padding. The fabric itself can be hand washed at a low temperature. The cushions also include ties at both the base and the back to enable you to secure the cushion to your chair. This high-Back Cushion is a one piece cushion which covers both the Seat and Back of the chair. Please note that due to the fire-proofing methods the material goes through there may, at first, be a slight mismatch of colours. However, these will all turn to the same colour with exposure to sunlight. The Cushion pad is 5cm thick and really nice to sit on, the cover is made with a fast drying waterproof fabric which has been treated for rot and fire. So if you happen to leave them out in the rain they will dry out quickly and they will also last for quite a few seasons. 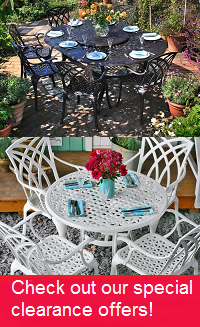 We purchased Lazy Susan garden furniture about 7 years ago and the table and chairs are still going strong! We purchased Lazy Susan garden furniture about 7 years ago and the table and chairs are still going strong! We have just changed the parasol and cushions (online order) due to normal wear and tear etc and have had an absolutely fantastic service. The delivery came within two days. We made a mistake on size of parasol and having called customer service, they advised of correct size and dispatched immediately and arranged to pick the other one up. They advise calling them up in future to get the right fits on accessories and replacements as they have a record of purchase. We don’t normally write reviews but the customer service is fantastic and would not consider using anyone else for garden furniture. Fast delivery and good quality. A bit fiddly to put together. Recommend ordering the matching cushions at the same time as you get a discount. Very comfortable to sit on. Very pleased with it. Brightens up the patio in the wintertime.